Nikolai Dobrynin: filmography, biography and personal life. Nikolai Dobrynin – popular Russian actor. The education of the future famous artist was engaged in his elder brother – Alexander. Thanks to him, Nicholas went to Moscow to enroll in drama school. Movies and TV shows with his participation are always popular among audience. In 2002, Dobrynin was awarded the title of Honored artist of Russia. Nikolai Dobrynin was born on 17 August 1963 in Taganrog. His father was a police officer. Unfortunately, he died very early. Even as a child, Nicholas loved dressing up in his father's jacket and depict scenes from war movies. Childhood Nikolai Dobrynin cannot be called simple. He spent a lot of time on the street, was a real bully. Often fought and participated in meetings of the "district to district". Early deprived of his father, Nicholas from a very young age understood what the money in the family was never enough. While still in school, Nicholas worked as a loader and amassing mailboxes. In spite of any difficulties, Dobrynin attended ballroom dance classes and participated in school performances. The elder brother of Nicholas – Alexander Dobrynin helped him after graduation to move to Moscow. Alexander advised his brother to try to enter the acting Department. Alexander himself later became a soloist of the Bolshoi theatre. Nikolai Dobrynin arrived in GITIS. His classmates were Dmitry Pevtsov, Vladimir Vinogradov. As a student, Nicholas married his classmate – Ksenia Larina. They lived together for five years. Nikolai Dobrynin graduated from GITIS in 1985 and was immediately accepted into the troupe of the theatre "Satyricon", which is headed by Arkady Raikin. However, the main role in the theater was not. Dobrynin nearly four years spent in the crowd. His first major film role Dobrynin received in 1987. He played in the movie "farewell, shpana Zamoskvoretskaya..." directed by Alexander Pankratov. In the late ' 80s Nicholas married again. His second wife was the famous actress Anna Terekhova. In 1988, he was born a son Mikhail, who did not want to be an artist – he became a psychologist. In the theater "Satyricon" Dobrynin did not play a significant role. In 1989, his acting talent to notice the famous Director Roman Viktyuk, who immediately invites Nicholas to work in his theatre. It is here that Nikolai Dobrynin is literally disclosed. It creates a complex psychological images which bring him fame in a theatrical environment. In the 90-ies of the last century, Russian cinema was going through not the best of times, but this time Nikolai Dobrynin's been in some decent films and has become popular among audience. The most famous work of Dobrynin in those difficult years – the main role in the movie "All of what we so long dreamt". In the 21st century, Russian cinema has gradually come out of recession. 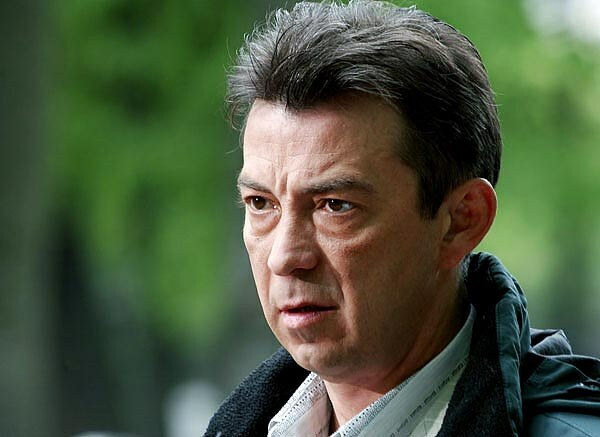 Nikolai Dobrynin active in films and on television. The time has come when he is no longer able to combine photography and film work on the stage. In 2004, he leaves the Theater. after 16 years of work. In 2009, the television screen comes the third season of the series "Matchmakers", where Dobrynin played the role of Mitya Buhangin. This role made the actor very famous. At first his character was planned as a minor character, but thanks to brilliant acting Dobrynin, Buhangin becomes the Central character of this Comedy series. Mitya so the audience liked that in 2011, the year was made a separate 20-serial television movie Tales mityaya". Nikolai Dobrynin was married a third time. His current wife – Ekaterina Komissarova. It has no relation to the actor's environment. Before her marriage she worked as a flight attendant. In 2008 the actor has a daughter, Nina. Dobrynin does not like to tell much about his personal life. We only know one thing: in his third marriage, he feels happy.